The Pennsylvania Workers’ Compensation Act applies to all workplace injuries and occupational diseases occurring during the course and within the scope of your employment. This could mean an accident that occurs during work, or in certain instances, before or after work. It could also mean an accident that occurs during as special mission or request made by the employer, or even an accident that occurs during a workplace social event or activity. You have a right to workplace compensation under the Act even if you have a pre-existing condition, such as a heart condition or a bad back, and you aggravate or worsen the condition at work. Negligence, whether it is yours or your employers, does not prevent you from receiving work injury benefits under the Workers’ Compensation Act in Pennsylvania. 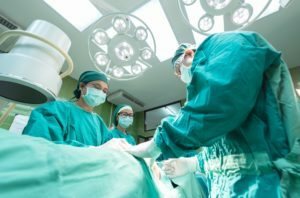 Pre-existing conditions and injuries caused “by your own fault” will not prevent you from recovering under the Act. No matter what your injury, if you have suffered an injury or medical condition at work or as a result of your employment, contact the Philadelphia workplace injury lawyers at Pearson Koutcher Law to discuss your right to receive injured worker benefits under the Pennsylvania Workers’ Compensation Act. Our work injury attorneys have years of experience representing injured workers in claims for all types of workplace injuries and medical conditions. Let us put our decades of workplace injury and workplace accident experience to work for you, helping you navigate the complexities of the Workers’ Compensation laws. 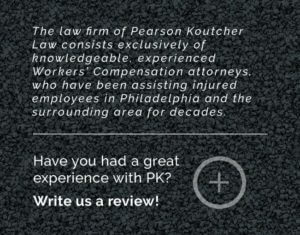 Pearson Koutcher Law’s workplace compensation attorneys have over forty years of combined experience investigating, negotiating, litigating, and getting results for our work injury clients. We strive to provide our work related accident clients with outstanding results through the hardest of times, respecting the emotional and physical strife we understand you’re going through. We always offer impeccable service and communication in your time of need.